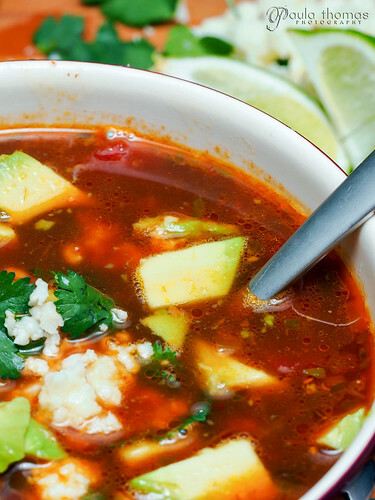 Pozole rojo de frijole is a Mexican soup known as red pozole with beans in English. I'm enjoying the variety of recipes in the Herbivoracious cookbook. In case you couldn't tell from the title, this one is Mexican. I've made my fair share of Mexican dishes, being half Mexican. I also did a cookbook project on the Authentic Mexican Cookbook a few years ago. I was pretty happy to finish that project because just about every recipe I made was a several hour process, especially soups. This pozole recipe did not take long at all because of a few short cuts. Using canned beans and canned hominy really cuts down the cooking time. It only took about an hour to make. Michael gives a variety of ingredients you can use as garnish for the soup: avocado, cilantro, cotija cheese, lime wedges, tortilla chips, shredded cabbage or lettuce, sliced onions and sliced radishes. I decided to use avocado, cilantro, cotija cheese and lime wedges for my garnishes. He also gave a few different options for dried chiles: arbol, ancho and guajillo. I went with the ancho and used 3 of them because I love the flavor the chiles add to the soup. The recipe only called for "1 or 2 or more if you like a lot of heat". Even though I used 3 it wasn't too spicy. I don't think ancho chiles are known for their hottness. I probably could have used even more. The soup was a success though I would have liked a bit more heat so adding some jalapeno or chile flakes would have given it some extra spice. It made four large servings which I enjoyed for lunch the following week. The video below shows all the ingredients that went into the soup, including a little blooper at the end. This is awesome, Paula! I've made this recipe a bunch lately too because I was doing it as a demo at several PCC locations, and then that got me craving it so I made it at home too. I'm delighted you enjoyed it, and nice job with the video, too!